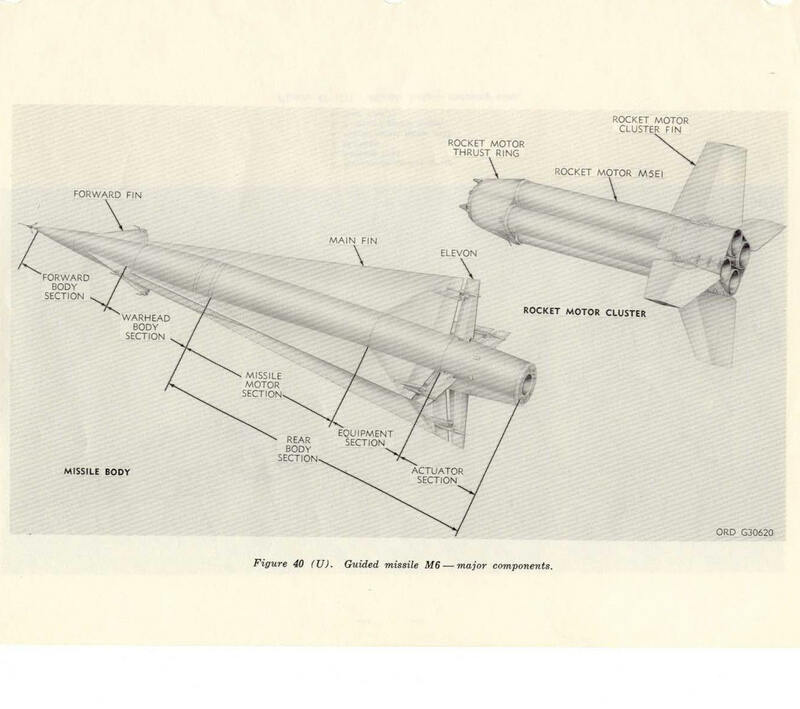 The Nike-Hercules missile, designated guided missile M6*, consists of the missile body and rocket motor cluster. The overall length of the missile is approximately 39 feet and the gross weight is approximately 10,550 pounds. 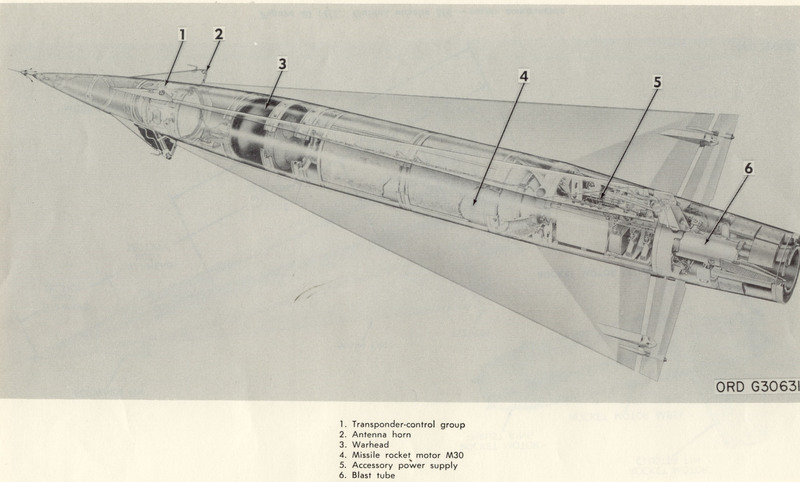 The missile body consists of a forward body section, a warhead body section, a rear body section, and four main fins. The missile body is approximately 27 feet long and the gross weight is approximately 5250 pounds. The maximum body diameter is 31.5 inches and the fin span is 90 inches. The forward body section contains the transponder-control group, the major component of the missile guidance set. Four forward fins are positioned at 90-degree intervals around the circumference of the forward body section. The antenna horns of the guidance set are mounted in the forward fins. The warhead body section contains the warhead and associated equipment. The rear body section consists of the missile motor section, the equipment section, and the actuator section. The missile motor section contains the major portion of the missile rocket motor M30 and associated equipment. The equipment section contains the missile batteries and either an accessory power supply or a hydraulic unit. The actuator section contains the actuator assemblies and mechanical linkage that move the elevons. The blast tube of the missile rocket motor M30 extends through the equipment section and the actuator section to an opening in the rear of the actuator section. The four main fins are positioned at 90-degree intervals around the circumference of the missile body. The main fins extend from the forward end of the warhead body section to the forward end of the actuator section. The four elevons are hinged to the trailing edges of the main fins and are connected to the mechanical linkage in the actuator section. The rocket motor cluster consists of a cluster of four rocket motors M5E1, a rocket motor thrust ring, and four rocket motor cluster fins. When assembled to the missile body, the rocket motor cluster fits over the actuator section of the missile body. The overall length of the cluster is approximately 14 feet and the gross weight is approximately 5300 pounds. The maximum width (less fins) is 34 inches and the fin span is 138 inches. *M6 was the original designation of the Nike-Hercules. This will blow up to a larger than screen size photo. You need to scroll the photo to examine the details.